Micah Hanks is a pretty smart guy. In this book, he draws together the UFO phenomenon with Futurology and Cosmology, creating a heady brew that aims at providing the new reader with a possible explanation for the enigmatic visitors to our skies. It is the author's contention that UFOs are the manifestation of travellers through time. But this book isn't as straightforward as The Time Machine or Dr Who - instead the very act of travel through the dimension of time leads Hanks to argue that the usurpers are Transhuman. That is, at some future date Artificial Intelligence has massively outstripped human intelligence, and has become integrated into the travellers themselves, who have become some kind of ultra-intelligent cyborgs. As we shall note in a moment, Hanks uses speculation from Cosmology to go even further and link the runaway computational capability with time travel directly. The point at which Artificial Intelligence surpasses humanity's is known as a Singularity. It is predicted to occur around 2030 (pp29-30). Given that secret government tech tends to be a decade or more ahead of the game (despite that wonderful oxymoron Military Intelligence) then its possible that that moment has already been reached in some darkened government lab somewhere. The theory goes that once AI itself gets properly going, then it will break through various barriers that allegedly hold humans back, and there will be a succession of leaps forward that create a virtuous circle of computer development. The resulting exponential explosion of intelligence thus created resembles a Singularity; mathematically similar in character to the event horizon theoretically existing at the 'edge' of a black hole (p60). Hanks wonders whether a creeping movement towards this is already underway in front of our eyes - does the Internet host the creation of artificial intelligence that is awakening in some electronic nexus? Will the Internet become a 'mother brain' that provides the world's first artificial consciousness (p57)? If it does, how would we know? Hanks wonders whether the inner machinations of a conscious Internet might be compared to Jung's collective unconscious (itself a theoretical construct) (p54). At this point in the book, the author plunges into Ufology. Although not entirely dismissive of the Extra-Terrestrial Hypothesis, he is far from convinced by it. He argues, reasonably convincingly, that some of the more classic UFO encounters from history that mirror emerging technology were exactly that - emerging technology being tried out in secret. He proposes that UFOs that appeared during WWII (the Foo Fighters, after which Dave Grohl's band is named) were essentially time tourists. I wonder whether other famous 'orbs' might be the same, like the UFOs that turned up over Mexico City to watch the solar eclipse on 11th July 1991, or the famous footage of an orb that buzzed Concorde in 1976. His overview of Ufology is brought short by a rather long account of his investigation of the four decade-old Locust Grove UFO encounter, and sees parallels with a more recent UFO appearing over Asia in more recent years. The book loses its direction at this point, and becomes ponderous and sometimes irrelevant. It does swing back eventually, though, about 50 pages from the end. Here, he discusses whether Transhumanism is the answer to the problems of inter-stellar travel through the exponential rise of artificial intelligence and cybernetics, drawing on the works of Alexei Turchin, Nigel Kerner et al. Maybe UFOs are robotic drones, the author wonders - a consideration given by many to the Greys. Indeed, he offers many ideas up to the reader. The only argument he doesn't include is about whether UFOs are real at all - he works from the basis that there is something to it, and that science could learn much from UFOs if only they allowed themselves to take the subject more seriously. The strongest thesis in the book appears towards the end. Hanks draws upon the words of Stephen Hawking about entropy, and life's requirement to be moving in the right direction vis-à-vis time. Some have argued that nanotechnology might provide computational facilities that create little, if any, heat as a by-product. Does this mean, Hanks wonders, that the inexorable increase in entropy in our Universe might be broken, even reversed? In that case, is time travel possible through a different kind of Singularity, where computational efficiency breaks through a thermodynamic barrier? It's a fascinating thought, although until that point is reached it can only remain a speculative possibility. "The UFO Singularity" is packed full of ideas, drawing upon many eclectic sources. The author uses some words I have not come across before - sometimes correctly, sometimes not: Scads (p95, a quantity roughly > a dozen); thusly (a barely recognised alternative for thus); scrupulosity (p100, a psychological disorder characterized by pathological guilt about moral or religious issues, used quixotically in the book to describe the media); Singularitarian (p105, to do with the technological Singularity discussed); and someplace (p161, which is not really a word). Language is a living thing, of course, and the author's creative use of it reflects his creative thinking in general. 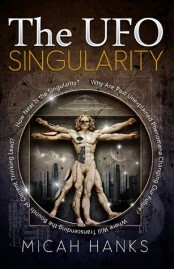 I really enjoyed exploring these ideas, and have learned a great deal about the potential repercussions of the upcoming technological singularity.